^ 1.0 1.1 Carlotto, M.J. Digital Imagery Analysis of Unusual Martian Surface Features (PDF). Applied Optics. 1988, 27: 1926–1933. （原始内容 (PDF)存档于2007-07-12）. ^ Whitehouse, D. Nasa: No face - honest. BBC. May 25, 2001 [November 9, 2007]. ^ Britt, R.R. Face on Mars gets makeover. CNN. September 22, 2006 [November 9, 2007]. ^ United States Geological Survey Astrogeology Program, Gazeteer of Planetary Nomenclature, "Mars Nomenclature" 页面存档备份，存于互联网档案馆. ^ United States Geological Survey Astrogeology Program, Gazetteer of Planetary Nomenclature, "Descriptor Terms (Feature Types)". ^ MacDonald, T.L. The origins of Martian nomenclature. Icarus. 1971, 15: 233–240. doi:10.1016/0019-1035(71)90077-7. ^ Head, J.W. ; Kreslavsky, M.; Hiesinger, H.; Ivanov, M.; Pratt, S.; Seibert, N.; Smith, D.E. ; Zuber, M.T. Oceans in the past history of Mars: Tests for their presence using Mars Orbiter Laser Altimeter (MOLA) data. Geophysical Research Letters. 1998, 25: 4401–4404. ^ Malin, M.C. ; Edgett, K.S. Oceans or seas in the Martian northern lowlands: High resolution imaging tests of proposed coastlines. Geophysical Research Letters. 1999, 26: 3049–3052. ^ Rayl, A.J.S. 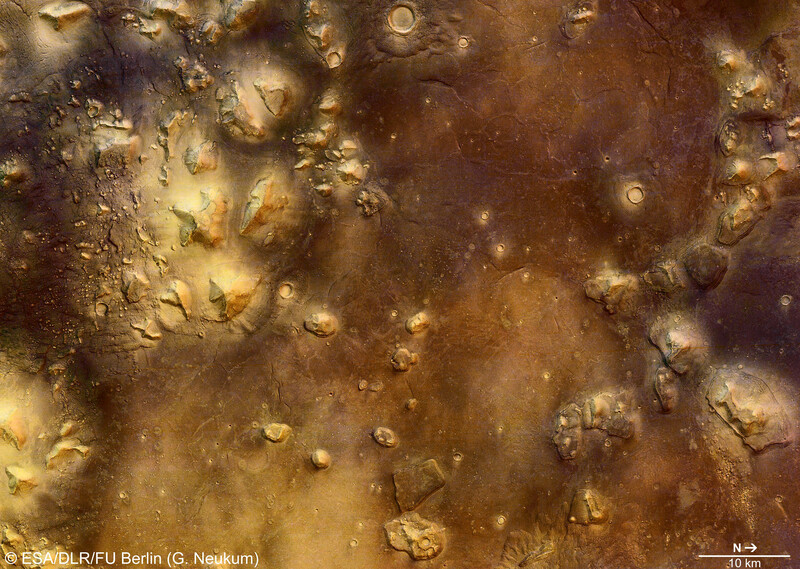 The Empire Strikes Back: Europe's First Trip to Mars Brings Home "The Gold". Planetary Society. March 16, 2007 [June 5, 2008]. （原始内容存档于2012年3月4日）. ^ Viking News Center. Caption of JPL Viking Press Release P-17384 (35A72). NASA. July 31, 1976 [May 1, 2008]. ^ Hoagland, Richard. The Monuments of Mars — A City on the Edge of Forever 4th. Frog Books. 1996: 5. ISBN 1883319307. ^ Pixel Inversion - NASA's Misinformation on the Mars Face. Paranormal News. August 25, 1999 [May 29, 2008]. （原始内容存档于2008年6月12日）. ^ Gardner, M. The Great Stone Face and Other Nonmysteries (PDF). Skeptical Inquirer. 1985, 10: 14–18. （原始内容 (PDF)存档于2005-04-28）. ^ Mission to Mars: Viking Orbiter Images of Mars website 互联网档案馆的存檔，存档日期2009-04-16., NASA Jet Propulsion Laboratory; raw data in IMQ (ImageQ) format can be downloaded from these links: 35A72[永久失效連結], 70A13[永久失效連結], 561A25[永久失效連結], 673B56[永久失效連結], 673B54 互联网档案馆的存檔，存档日期2009-05-11., 753A33[永久失效連結], 753A34 互联网档案馆的存檔，存档日期2009-05-11.. Retrieved on September 20, 2007. ^ Cydonia: Two Years Later. Malin Space Science Systems. April 5, 2000 [December 1, 2008]. ^ Fitzpatrick-Matthews, K. The ‘D&M Pyramid’. Bad Archaeology. August 17, 2007 [December 1, 2008]. ^ 21.0 21.1 Cydonia's 'Face on Mars' in 3D animation using Mars Global Surveyor imagery. ESA website. October 23, 2006 [April 26, 2007]. ^ Popular Landform in Cydonia Region. HiRISE website. [April 26, 2007]. （原始内容存档于2016年6月4日）. 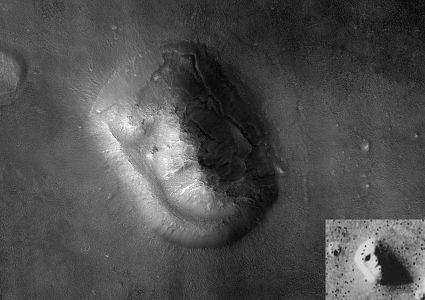 ^ Cydonia - the face on Mars, 3D rendering of Mars Express imagery. ESA website. September 21, 2006 [April 26, 2007]. ^ Britt, R.R. 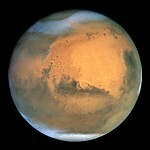 Scientist attacks alien claims on Mars. CNN. March 18, 2004 [October 12, 2007]. 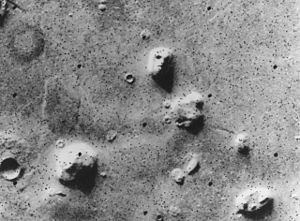 ^ The Face on Mars, Viking Project. NASA website. [April 26, 2007]. ^ Dunning, B. The Face on Mars Revealed. Skeptoid #97. April 22, 2008 [August 26, 2008]. ^ Badlands Guardian Geological Feature. Google Maps. [April 26, 2007]. Interactive 3D "Face on Mars", Shockwave piece at MarsQuest Online.